When was the last time you had to beat egg whites? When you made meringues in your home economics class and were probably made to put the bowl over your head to check if you’d beat them enough. Long gone are the days of beating by hand, now that stand and hand mixers are common kitchen apparatuses – taking half the time and causing half the embarrassment of under beaten egg whites. 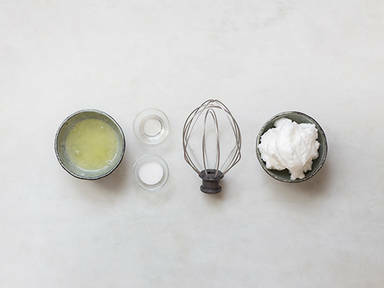 Simply add the egg whites to your stand mixer, start to beat them at a low speed for approx. 30 seconds, then add a pinch of salt and set your mixer to the highest speed, beating until the egg whites are at the desired consistency. For optimal results, the mixing bowl needs to be completely grease free, so be sure to wipe it down with a paper towel dipped in vinegar before you start to beat the egg whites. Another lesser-known fact is that a copper bowl reacts with the egg whites and causes them to form stiffer peaks when being beaten, so if you happen to have a copper mixing bowl, then now is the time to use it.